Buffalo Trace Distillery tells BourbonBlog.com they will release a bourbon whiskey aged in seasoned wood oak barrels in late March 2016 as one-time-only release. 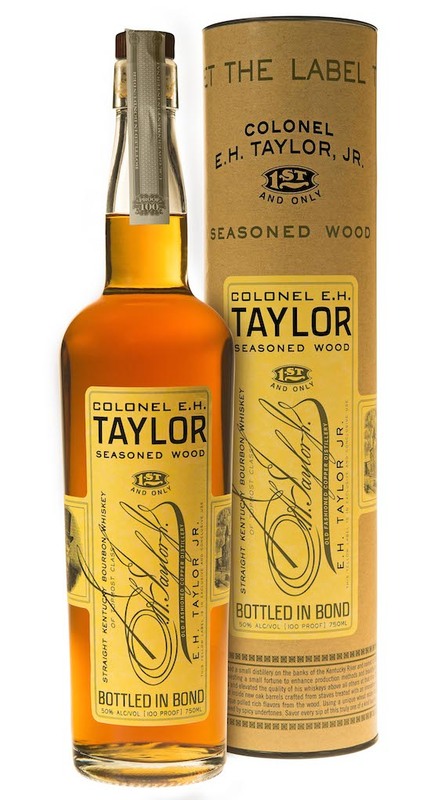 The Colonel E. H. Taylor, Jr. Seasoned Wood Bourbon Whiskey retail price is $69.99 per 750ml bottle. This 100 proof, Bottled-In-Bond, small batch wheat recipe bourbon was aged well over a 10 years. The barrels in this release underwent a variety of special seasoning processes, including barrels made from staves that were immersed in an enzyme rich bath with water heated to 100 degrees. After spending time in this proprietary solution, these staves were then placed into kilns and dried until they reached an ideal humidity level for crafting into barrels. Other staves were seasoned outdoors for six months, and still others were left outdoors for a full 12 months before being made into barrels and sent to Buffalo Trace Distillery to be filled and aged. All barrel staves were seasoned, dried, and crafted at Independent Stave Company, who consulted on this project with the premiere expert on oak maturation, Dr. James Swan. This Seasoned Wood Bourbon is the eighth and latest release in the collection of E. H. Taylor, Jr. whiskeys, rounding out the collection of Old Fashioned Sour Mash Bourbon, Single Barrel Bourbon, Warehouse C Tornado Surviving Bourbon, Barrel Proof Bourbon, Straight Rye Whiskey, Small Batch Bourbon and Cured Oak Bourbon. The Sour Mash, Warehouse C Tornado Surviving Bourbon and Cured Oak were one time only releases and are no longer available. The Colonel E. H. Taylor, Jr. collection was first released in early 2011 and several subsequent releases have followed. Colonel Edmund Haynes Taylor, Jr. is widely considered one of the founding fathers of the bourbon industry, fighting for the Bottled-in-Bond Act of 1897, nearly three decades after he purchased the distillery that is known today as the Buffalo Trace Distillery. For more updates on new bourbon releases, subscribe to our Bourbon newsletter.